Make Teleflora your choice for Houston flowers. Whether it’s a birthday and anniversary, flowers are a wonderful surprise for your loved one in Texas. Our local Houston florists service Spring, Clear Lake, The Woodlands, and beyond. Most orders placed before 12 pm are available for same-day delivery to the Houston area. If someone you know is not feeling well, send them a wonderful gift of “Get Well” flowers. Bright yellow blossoms, potted green plants and hand arranged gift baskets will lift their spirits. Our member florists service all major Houston hospitals including West Houston Medical Center and the MD Anderson Cancer Center. Even if you’re thousands of miles away, your Teleflora bouquet is hand-delivered for a personal touch. Our “Thinking of You” bouquets can help you span the distance. You’ll both feel a little closer when you send flowers to Houston. Did someone you know get a new job, have a new baby or graduate from college? If you can’t be there in person, fresh flowers will let the recipient know just how happy you are for their new accomplishment. "Congratulations" bouquets are the perfect gift to send! Houston flower delivery has never been so easy. Simply provide the name of the Houston hospital, office, residence, or funeral home and we’ll take care of the details. 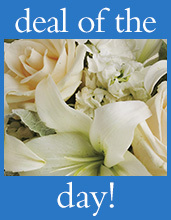 Warm up someone’s day when you send a lovely floral gift from Teleflora.